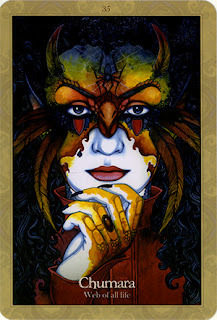 Sunflower 10 asked a series of questions on a topic that is private, but I answered them with at reply from the Dragonfae regarding what they want her to know at this time, which was the card Nimue, and the short of it was 'Free yourself! ', but my interpretation and the three spread follows now. And further below are the individual cards and the full texts where I've found them. 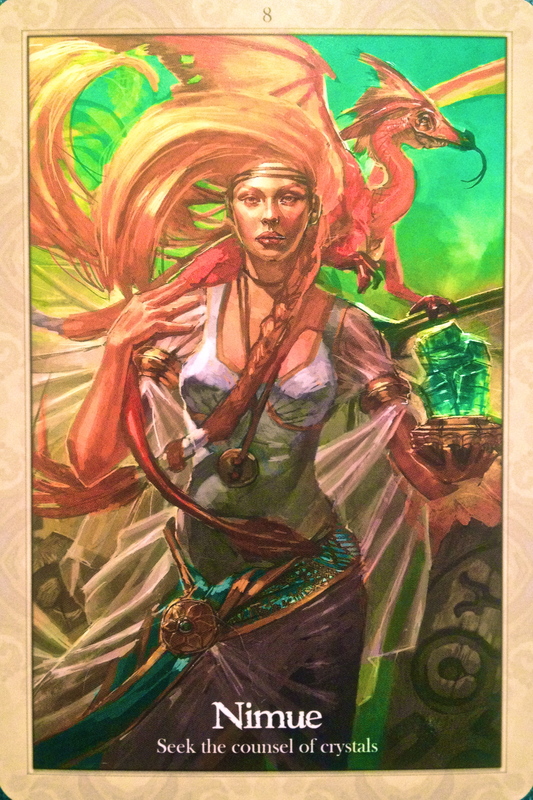 Nimue - Seek the councel of crystals. "Make a commitment to thy own self now – she, who you truly are, is worth this trust, this pledge, this courage you must have to birth your own changing self. For I am gentle, but I too have no more time to spend if you wish to waster the jewels life has given you. I will turn away, because it may not yet be your time. Only you can say it is not so, and walk forth into your new self, with me as guide and light, with transformation as your nature, with your incarnation without material death as your truth. Do this with me: “Bless thyself. Love thyself. Know that you are beyond your own imaginings. Act this day, this hour, this minute, and change will flow. Do not hesitate. Be transformed now." 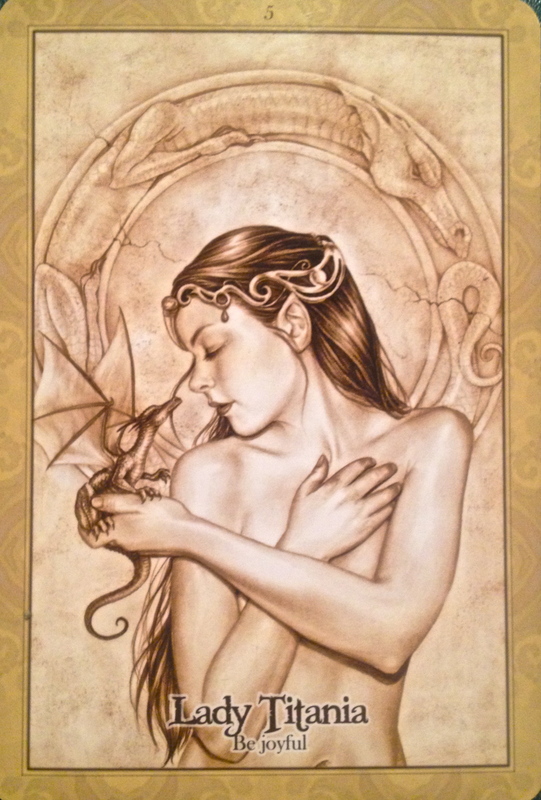 This Dragonfae has the power to create anything you wish for and desire, I am convinced she is asking you to direct your attention to what is truly worthy of your desire - your own divine transformation. You [..] can work with crystals to clear yourself of others and your own expectations. Nimues message is 'free yourself'. PAST / roots: Tatsuya - Have Courage. Tatsuya means 'becoming dragon' in Japaneese and she shows up when a great transformation is imminent. There will be a lot of fears but she will be your fierce companion, giving you courage to deal with the root of the current issues. Tatsuya is namely a helper of removing toxins, addictions and addictive behavior - and in the process becoming all that you can be. The beginning of the journey of growing into your full self. NOW/ action: Chumara - Web of all life. Chumara is telling you that now is the time to start showing your real vulnerable face - in safe places at first. Chumara weaves the web of life, daily she looks at her web, what needs remaking, what needs to be let go. "I ask you today to look at the webs in your life that must be remade and rewoven... " FUTURE / outcome: Lady Titania - Be joyful. "Celebrate yourself! There is no true happiness without joy in being who you are. " Lady Titania promises that after hard work comes play, dance, friends and supportive soul family. So the outcome of the actions in this reading, will be the ability - and you are urged to find it :) - to rejoice in who you are, to sing and really celebrate with social gatherings and friends who are nurturing and supporting your spiritual growth. Friends who you feel safe showing your true self to. Divinatory Meanings: “It is time for you to free yourself from the confines of others expectations and investigate other less conventional ways of making a living. You may be drawn to a particular crystal at this time, and may enjoy simply entering into more regular communion with the element of earth and its minerals. Wear jewellery that has been cleansed by you, and energized by you, and understand its significance and power for you. Make each piece you choose to wear a totem symbolizing your own self, adorning and expressing who you truly are. Above all, the message of Nimue is to free yourself. Stop expecting others to unshakle the chains and force you to walk free. You, and only you, can remove that which is holding you back. "We will go through the crucible, every one of us, and emerge changed. Ourselves but not ourselves. Now it is your turn, and you need not be afraid. For your fear will only hurt you, while your courage, in being tested and exercised, will show you so much of your great potential. For you are heroic, noble and able to pass through this. And while it may change you, it will do so in magnificent ways. Are you ready? No? Well, put aside your fear and follow me anyway. I will teach you the truth about recovery from grief and recovery from ddictions. I will teach you how to face that which you fear, and move forward anyway. You are now in the process of deep transformation and by entering this door and facin the unknowable, you will find new hope daening before you even dare to dream of it. The secont you take action is the moment you will be changed. The more you explore and investigate this capacity of yours to be courageous, the more astounded you will become at your own ability to miracoulously, naturally transform yourself. Inellectually, you undrstand this. But you body hesitates at the blossoming of it: do it now. You will then start the process of moing through to a new stage. Your fear masks a deeper dilemma; that of not being your true self and of not knowing that true self. This stage will see you reveal your spiritual beliefs, live with integrity, open up emotionally and become richer and more blissful in every way. With this test of courage, you will shatter the illusory barrier that lies between you and true self-love and self-worth. From this test you will learn to love this individuality, to recover from conditioning and to emerge truly yourself, beautiful and ready to fly. Come through the door. There is nothing to fear. You will see"
Tatania speaks: “Celebrate yourself! There is no true happiness without joy in being who you are. Over this next moon cycle, the forthcoming 28 and a half days, many opportunities will come to you to play, revel, dance and explore the moonlit and joyful part of yourself that has been truly too long neglected! It is time to come forth from the place where you have been taking shelter and quiet time, and partake of the joy of good sweet company. Know that everyone, including the beings of the Dragonfae, is delighted and happy to know of your ability to delight in your own self. Celebrate, and we celebrate with you. Hail, joyful kindred spirit and be welcome to the feast! About Titania: Faery Queen Titania’s name means, literally, daughter of the Titans. 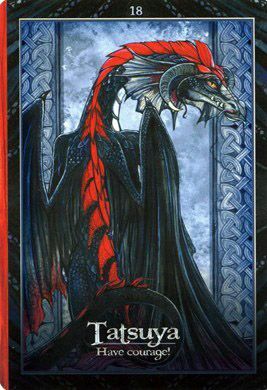 The Titans were the elder gods who were the children of Heaven and Earth, and sprang from chaos, along with the Dragonfae, who were also born of the divine. They included Saturn, Rhea, Oceanus, Hyperion, and others. In Ovid’s Metamorphoses Titania is another name for Diana, as well as other goddesses of the night, queens of the shadowy world, ruling over its mystic elements and powers. So, there is no separation: the titans are the goddesses, the goddesses are the Dragonfae. Like Isis, who personified the feminine, generative principle of universal nature, Diana and the others are all nature goddesses. So, rather than being a diminutive creature of delicacy and daintiness, Tatiania is tall, very powerful and very strong. She is of the elfin race where the height and the features are very pronounced, with enough Dragonfae blood in her veins to ensure she is a creature who can fly, and endure for many millenia. She is one of the oldest ones still with us, and yet her path for this time, and for you, is to help to celebrate with others as the joy of being alive. Just as you are feeling old, despairing and fatigued, she will sweep you up in her strong arms, show you the treasures of your life, and lay out a feast for you to partake in with others of your kind. Because being lonely and isolated is no longer an option for you.